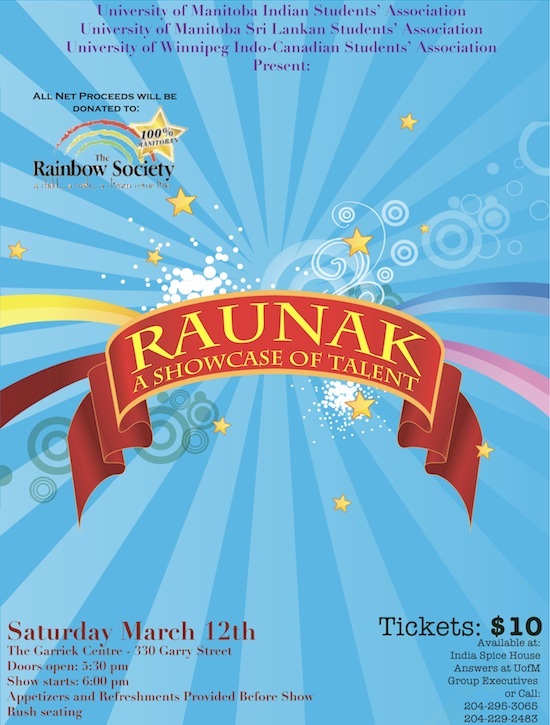 Three student groups from the University of Manitoba are putting on a culture show to benefit the Rainbow Society on Saturday, March 12. The RAUNAK culture show will showcase local talent from various cultures throughout South Asia. The goal of RAUNAK is to bring together all South Asian communities in an evening of cultural performance and display the wonderful local talent Winnipeg has to offer. Proceeds from the evening will support dreams of Manitoba children suffering from life-threatening illnesses. The show will be held at the Garrick Centre beginning at 6 p.m. Tickets are $10 at Answers, located on the main floor of University Centre, and at the University of Winnipeg information booth. Doors open at 5:30 p.m. The event is being put on by the University of Winnipeg’s Indo Canadian Students Association (ICSA), the University of Mantioba’s Indian Students Association (ISA) and the Sri Lankan Students Association (SLSA).